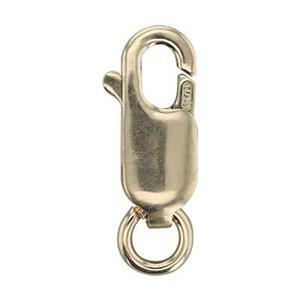 Outstanding savings on bulk lobster clasps! Halstead offers the best prices in the trade on these critical findings. 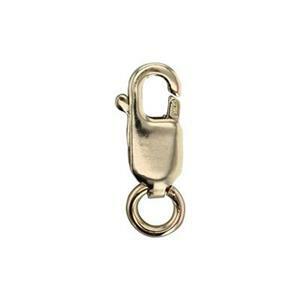 Lobster claw jewelry closures are essential components for finishing jewelry chains or necklaces. These fasteners have a secure connection and an easy trigger mechanism. They are more heavy duty than economy spring rings, yet more affordable than fancy clasps. Compare for yourself and stock up! These closures are named after the ocean crustacean claws that occur in nature and have a similar shape and trigger movement. Operate a lobster connector by pinching the protruding lever on the back. This will trigger an internal steel spring to open the jaws on the opposite side of the component so you can grab a jump ring or link to create a connection point. Lobster claw clasps are sold in different shapes and sizes so you can select the piece that most closely matches the rest of your design. Oval or trigger lobster claws have a pear shape and are typically the most popular. 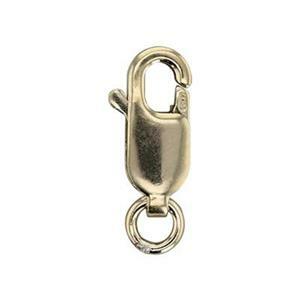 Standard lobsters are long ovals that give a streamlined look with certain types of chain and beading. Fancy shapes include rectangles, infinity figure-8's, or heart shaped lobster clasps. 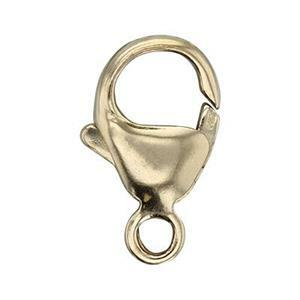 Most lobster clasps are made in Italy. But, you can see complete product specifications such as weight, dimensions and special features in the item detail pages for each of the closures we sell.